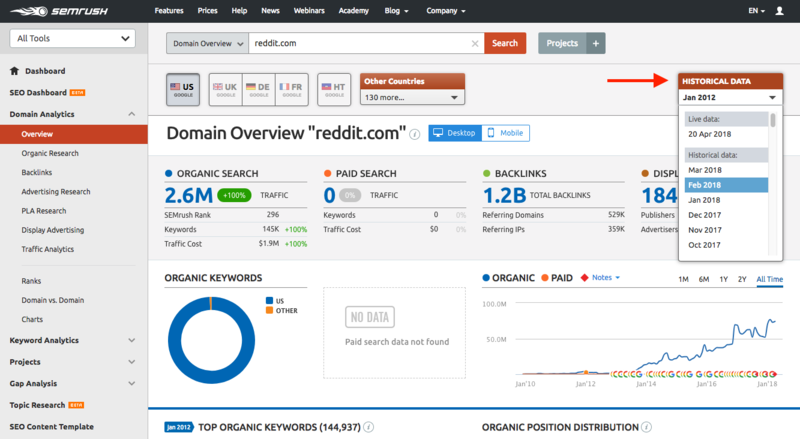 Historical data in our Domain Analytics and Keyword Analytics database enables you to perform research on keywords and domains on a month-to-month basis dating back to January 2012. These data points represent averages for the particular month and can be accessed through the Live Data box seen at the top right of the interface. Clicking the date will display this dropdown menu in which you can select a particular month to see data for. In order to access Historical Data, you will need the Guru level package or higher. Historical data is available for 11 databases* dating back to January 2012 and 15 regional databases** dating back to December 2013. * The United States (Google and Bing), the United Kingdom, Canada, Australia, France, Italy, Germany, Spain, Russia, Brazil. **Belgium, the Netherlands, Israel, Ireland, Denmark, Finland, Norway, Sweden, Switzerland, Poland, Turkey, Argentina, Mexico, Hong Kong (China), and Singapore. In the 89 regional databases added in December 2016, historical data is available back to December 2016. For SEMrush Product Listing Ads, historical data is available for the US regional database dating back to September 2013. Since data in the Traffic Analytics tool is gathered separately from our main databases, Historical data in Traffic Analytics can go back up monthly to April 2016. When you launch a campaign in the Social Media Tracker, your project is able to gather either 60 days or 2,000 posts of historical data - whichever comes first. Position Tracking will collect historical data from the date that your campaign is created. The tool will save daily data points for up to 60 days and save your weekly data points for up to 140 weeks.